The Environment and Skin Health Issues - Aspire & Co Ltd. Most of us are aware of the effects the sun has on our skin, but when it comes to day to day implications of the environment on our skin, many of us are not as clued up. We are slowly being more educated on the matter, with sales of anti-pollution skincare – with moisturisers and cleansers especially – shooting up by 30% in just six months. Dr. Isabel Sharkar from Sond Skincare reported that, every day, microscopic specks of soot, smoke and acid are released into our atmosphere, ‘When the particles sizes are smaller than our pores, they infiltrate the deeper layers of our skin.’ And it’s not just car emissions that are causing skin health problems. Blue lights from our phone and cigarette smoke also pose a danger to the skin’s appearance, and worse, can influence DNA damage. The main visible signs of air pollution on the skin will be a general lack of hydration, decreased radiance and aggravated skin conditions such as eczema and allergies. The potential damage caused by air pollution has been pretty well captured by Dr Mervyn Patterson of the Woodford Medical clinics, United Kingdom, when he says, “Unless people do more they will end up wearing the pollution on their faces in 10 years’ time. It is definitely something people now need to take seriously.” (The Guardian, 15 July 2016). It goes without saying that unless you lock yourself in a room, inevitably you will be in contact with environmental threats, especially if you live in a city. A healthy lifestyle will help ease the effects, such as not smoking and making sure you’re getting all your vitamins and nutrients. Other than aiding our bodies, we can help our skin by preventing and protecting against the threats of air pollution. so rather than avoiding them, we can prevent the dangers. Sticking to basic skincare rules such as always removing makeup and washing the face at the end of the day will make sure you are getting rid of any dirt on the skin. To remove dead skin cells further, regularly exfoliating with a gentle but effective exfoliate. Alongside an SPF, other protectents can include facial sprays. pHformula’s P.O.W.E.R e ssence tonic designed specifically to protect your skin against pollution. The P.O.W.E.R essence tonic contains ingredients that work quickly to protect the skin and leave it feeling firm, hydrated and refreshed, while also priming it to better absorb other products. Perfect for all skin types and requiring only two sprays daily, it contains anti-ageing, skin brightening and hydration complexes. The anti-pollution properties also include an all-important defence complex that scavenges free radicals and works hard to protect you against the damage of pollution while actually accelerating surface cell renewal by up to four days. To banish a dull appearance, the introduction of vitamins both to your diet and skin will be the key to gaining glowing skin. 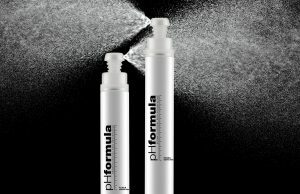 pHformula Vita C corrective serum improves tone and texture and restores a youthful appearance. Similarly, it’s sister product pHformula Hydra Serum re-hydrates skin that has lost moisture and elasticity. This Serum contains a combination of ferulic acid and vitamin E to restore the skin, alongside a hyaluronic acid complex that boosts hydration and forms an effective skin barrier prevent water loss. 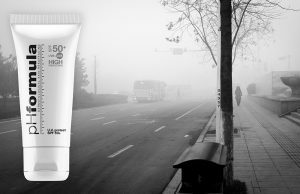 A visible effect of air pollution that many of us will be suffering from, is the signs of ageing skin. The loss of radiance can speed up of the natural ageing process with more fine lines, wrinkles, age spots and pigment changes occurring. Pollutants can also contain particles that penetrate the skin’s protective barrier, sucking out moisture and drying the skin’s natural oils which will contribute to an ageing appearance. pHformula’s peptides were designed specifically to fight the signs of ageing. POINT MULTI-PROTECT is a peptide infused anti-ageing moisturiser with sun protection factor 15 which hydrates and protects the skin with use of peptide formulations. Without peptides, skin doesn’t remain intact and the results is loss of firmness, appearance of wrinkles, enhanced by air pollution. Your local pHformula specialist can devise you a skin treatment plan based on your skin type and issues, including those due to environmental effects. Maintaining a skin care routine with pHformula will not only protect against air pollution, but help repair damage also.